This Greek Yogurt Chicken Salad does not have mayo. I KNOW. I can hear my sweet Alabama gal pal, who is an aficionado of all things chicken salad, gasping in horror. Actually, she’s far too genteel for such a gesture. I’m sure she has a very polite, socially appropriate sound effect for a chicken salad recipe made without mayo, which she considers an essential condiment for creamy salads of all kinds. If I find out what it is, I’ll report back. 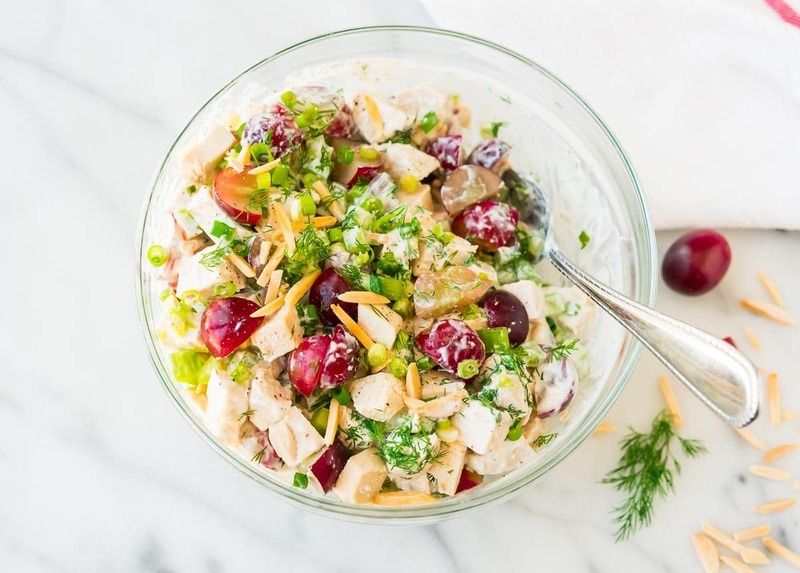 For a fast, easy way to cook your chicken for this Greek Yogurt Chicken salad, don’t miss yesterday’s video tutorial for how to cook shredded chicken (you can use the same method to dice). Do you have any favorite ways of making chicken salad or must-have additions that I missed? I’d love to hear about them! Leave your thoughts in the comments section below. Oh my goodness! I’m filing this one away to make soon as this is right up my alley. I’m a no mayo gal myself and I’m from the south. I’ve used sour cream and ranch dressing over the years as a substitute, but love the Greek yogurt idea to make it healthy. I’d cringe too if my sandwich was cut with mayo on the knife! Non-mayo people unite! ? Glad to know I’m not alone, Robin! I hope you love this version! I’m not a fan of mayo either. I use greek yogurt in tuna salad: it’s delish & so much healthier. 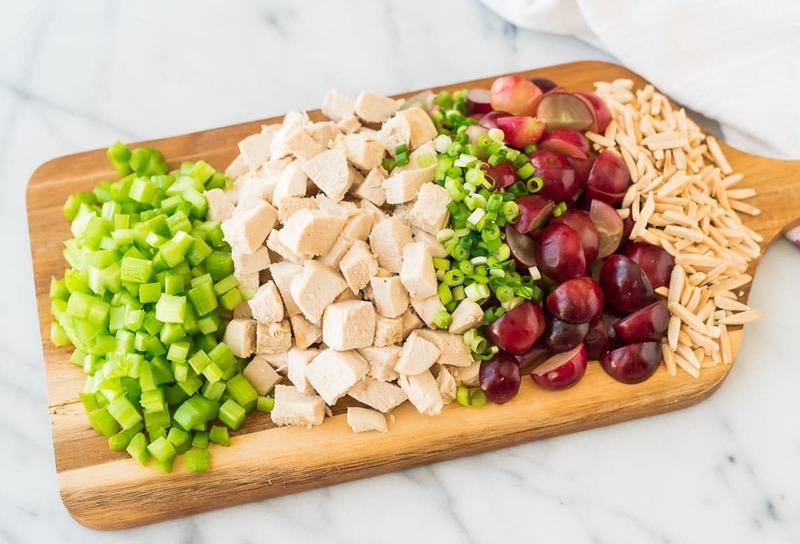 Love this recipe, I need to buy grapes so I can try this. Thank, Kelli! I hope you enjoy the recipe! Ugh mayo has grossed me out for the longest time, the top reason why I never ate chicken or egg salad! Thankfully greek yogurt is something I can deal with, making it possible to enjoy this creamy filling salad! Greek yogurt really is awesome! I hope you love this recipe if you give it a try, Bethany! I love chicken salad but never had it with dill (which I love). I usually add tarragon to it. Love all the textures in this! Pinned! Tarragon sounds delicious too, Maria! I’d love to know what you think if you give it a try with dill. I do like mayo but I also like yogurt and think the tang would be really good in here! And you’ve got sweet and crunchy, which is a must for any chicken salad in my opinion. I’ve used grapes, cantaloupe, apples and even pineapple. Your mayo blip made me laugh! I used to eat globs of it on my sandwiches as a kid, but don’t use it much as an adult. I have to say though, if you’re willing to give another brand a shot, Sir Kensington’s mayo made with avocado oil is delicious. I haven’t had mayo in my fridge for years, but got a sample of this stuff and now have a full jar. It’s so good! 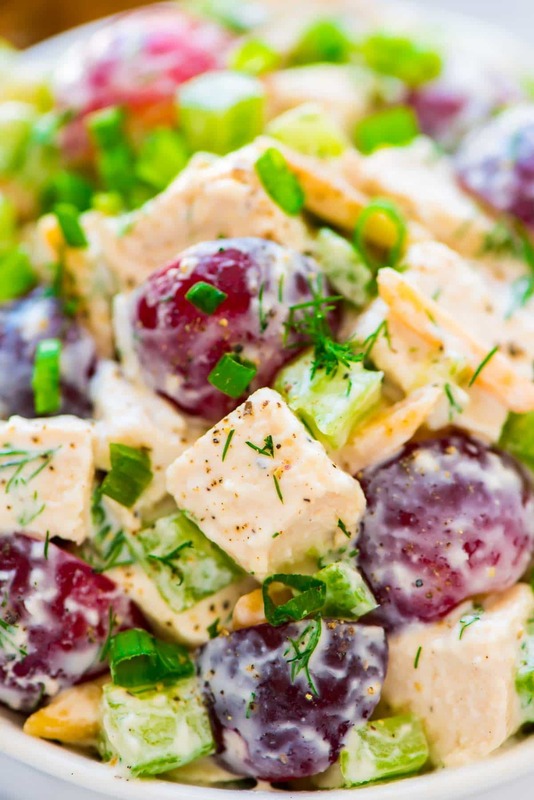 However, I will be making this chicken salad this weekend with yogurt. I’ll save the mayo for my burger! Marci, it sounds like you had the exact opposite childhood mayo experience, haha. ;) Thanks for the tip about Sir Kensington. And I hope you enjoy this version of chicken salad! This looks amazing! Would it be possible to substitute dried dill for the fresh in this recipe? I always have that on hand. Thanks! Thanks so much, Kristen! The general rule of thumb is to use 1/3 the amount called for when using dried herbs instead of fresh. That said, if you have the option to use fresh, I definitely recommend it because the flavor is more pleasant, but dried will certainly work in a pinch! I tried this and it was AMAZING! Thanks for sharing! This recipe is delicious. I’m not a big fan of dill so I left it out and it is still so very tasty. Thanks for sharing recipe. Diane, I’m so glad you enjoyed the recipe! Thanks so much for sharing this great review! Any tips for making this if I don’t have milk on hand today? Can I dilute with water, or plain kefir? Hi Olivia, I think your idea to use plain kefir is a good one! Hi. What are the nutrition facts for this recipe? Looks great! Hi Rose, the nutrition facts are located just below the recipe. Thanks! This recipe is SO delicious! The only thing I changed was adding a teaspoon dijon mustard and 2 teaspoons lemon juice. I would recommend this recipe to anyone looking for a tasty and healthy meal! Stephanie, thank you so much for giving this recipe a try and reporting back with your tweaks! I’m so glad to hear you enjoyed it. I’m so glad you enjoyed this recipe, Danny! Thanks so much for taking the time to leave this great review. I seriously make this all the time! It’s so flavorful, healthy and easy to make! Thanks Erin!!!!! I’m so happy to hear you love the recipe, Tracy! Thank YOU for taking the time to leave this awesome review! Oh YUM! I’ve been on the lookout for something new for lunch, that’s healthy. I get so tired of the same thing over and over again. This recipe is it! I can’t wait! Thanks for sharing it. I just love the different textures you have going on in this chicken salad. This recipe looks great. Erin, do you think I could use almond milk, rather than regular milk? Thank you. Hi Nancy, I haven’t tried it myself, but the milk is a small amount and used to thin out the dressing, so subbing almond milk should work. I hope you enjoy! The minute I saw this recipe I HAD TO make it! So delicious. I did not include the nuts and only had dry dill on hand and it was fantastic. It also (for anyone who cares) is a great great recipe for the new Weight Watchers plan. Kudos for such a simple and amazing dish! YAY!!! I am so overjoyed to hear this. Thank you for trying the recipe and taking time to leave this glowing review! Ok, honest rate here. I don’t do Greek yogurt and have never tried grapes in my chicken salad. Just a boring country girl I guess lol, BUT I love chicken salad and was looking for something good and healthy other than using mayo. This is it!! It is delicious. I made it exactly as the recipe calls. Thank you for a great recipe. WOOHOO Jackie, I’m glad to hear this recipe was a hit! Thanks for giving it a try and for taking the time to report back and share your honest feedback! Angela, I’m so glad you enjoyed the chicken salad! Thanks so much for taking the time to share your tweaks and review! Oh my goodness! I just made this for my work lunches this week. Sooooo delicious. I omitted the honey and almonds (slight almond allergy), and added a little lemon juice. It’s so yummy. I had to shove it in the fridge before I sat down and ate the whole thing! I am so happy to hear that Chrissy, thank you! And thank you for leaving this glowing review too. It means a lot! I made this for dinner tonight, and so much yum. 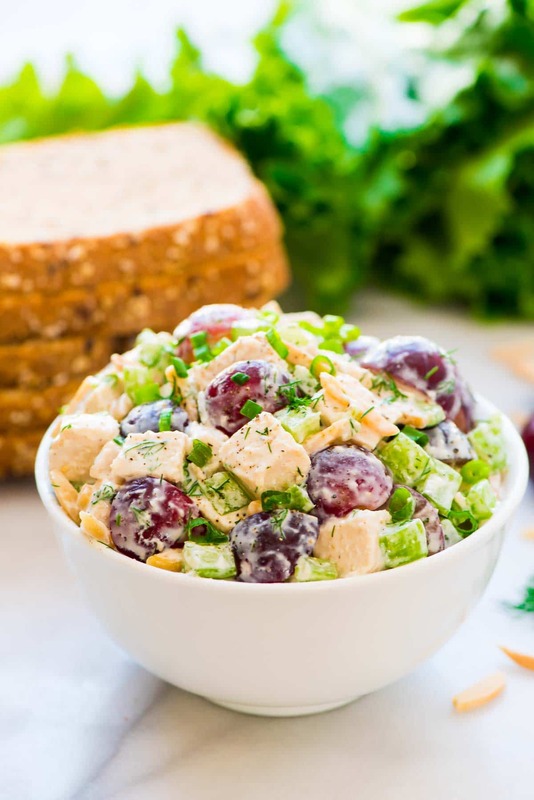 I’m a huge fan of chicken salad anyways, but I’m always on the look out for healthier options, and omg this is probably my new favorite chicken salad recipe. I don’t have any particular aversion to mayo, but the greek yogurt, imo, is so much better then the mayo recipes out there. so big kudo’s, I’m adding this to my recipe rotation. Louise, THANK YOU! I am so happy to hear how much you enjoyed the recipe. Thanks for taking time to leave this wonderful review too! Made this and it was SO DELISH!!! Loved it so much I had to share I t with my sisters, since we are all trying to eat healthier. I wasn’t sure about the Greek yogurt but it gave the chicken salad the creaminess it needs. I loved all the textures, especially the toasted almonds! Definitely saving this recipe! Prissy, I am SO happy to hear this, thank you!! As said it improves with time. When I was young I used to make it with lightly whipped double cream – too many calories these days. Maybe one day people will agree on what cooking units to use. How much is a “cup”. The US and the UK disagree about how many fluid ounces are in a pint, while most of the world has no idea what a fluid ounce is. I wanted to make a chicken salad but had no mayo on hand and I usually mix the mayo with yogurt anyway, so i thought I would give this recipe a go using the recipe as a base with what i had on hand. Used an organic probiotic Bulgarian yogurt which was thinner than Greek yogurt so left out the milk. The honey with this tangy yogurt was perfect! Everything’s else in the dressing was the same. I Didn’t have grapes so I used a tart apple (peeled and diced), and I used an omega trail mix for the nuts and cranberries (it also had pumpkin seeds, walnuts, and mango bits) that I chopped up a bit, and dried dill that I mixed into the dressing. It was fantastic and I wish I had made more dressing to serve on the side since I served the chicken salad with crackers and mixed greens and would have poured some dressing on the greens. Christine, I’m so glad you enjoyed this recipe as a great base and your tweaks sound so yummy too. Thank you for sharing! So good!!! I don’t ask my husbands opinion on food anymore because he critiques EVERYTHING. When my husband said to put this in the rotation the first time I made it I was surprised because it usually takes me a couple times to dial in a recipe before I get the final nod. This has been a hit every time I make it. I especially like how I can use Greek yogurt without it being noticeable (must be the honey). The grapes make it fresh and add moisture. I use a de-boned rotisserie chicken and its a meal I don’t have to cook! Win-Win. Thanks!! I’m glad it’s a winner, Jennifer! Thank you so much for taking the time to report back! I made this tonight! I didn’t have red grapes so I used green instead. I was worried that it wasn’t going to be good as I was making it but it turned out delicious! I’m so glad you enjoyed it, Jess! Thank you for taking the time to leave this comment too. Dee I am so happy to hear that you enjoyed it. Thanks for letting me know and for the meal prep tip too! Thanks for taking the time to leave this review! I’m so glad you enjoyed it. I made this as a part of my lunch meal prep this week, and I was so excited to has something so fresh to eat this spring! But unfortunately this meal simply just has no flavor at all…like at ALL. The grapes were my favorite part in it….. Wouldn’t recommend. Hi Terra, I’m sorry to hear the salad wasn’t to your taste! We enjoyed it, but I know it’s disappointing to try a new recipe and not love it. Thanks for taking the time to report back, Caitlin! I’m glad you enjoyed it. 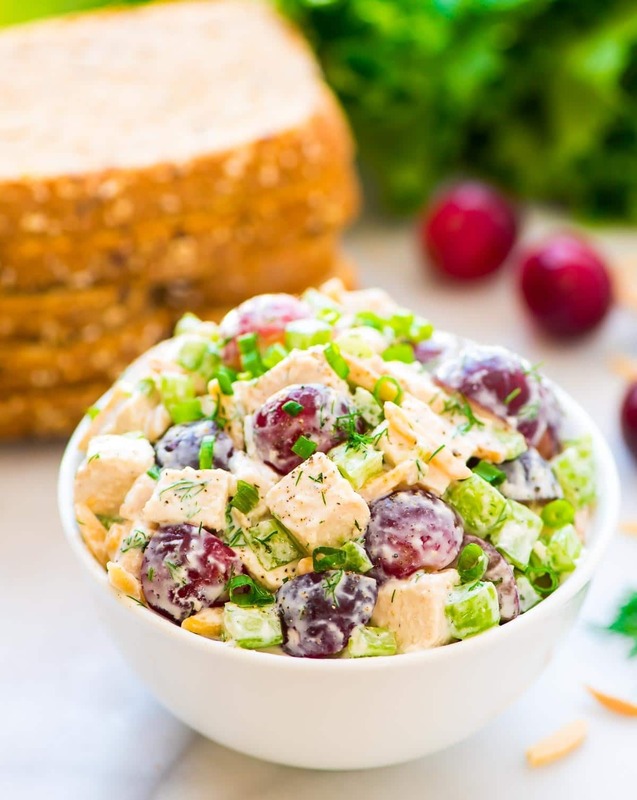 Refreshing and summery, this chicken salad is the best! My husband, who doesn’t normally like chicken salad and was a bit grossed out by the thought of using Greek yogurt, couldn’t stop eating it. We kept sneaking bites out of it like we do left-over cake. It was full of flavor, but perhaps that depends on the ingredients used? I brined and baked the chicken breasts (flavored with a bit of Mrs. Dash Garlic and Herb) so they were very tender and used the Fage 2% plain Greek yogurt because it has a clean taste. I used a little less green onion than the recipe called for. I finely chopped/crushed the fresh dill and added it to the sauce mixture instead of sprinkling it on later, added a tablespoon of avocado mayo, and used a thick, raw honey. This will be my go-to dish to take to potlucks. Melody, I’m so glad to hear this recipe is a hit for you! Thanks for taking the time to share such an in-depth review.